I am so thankful for many people and things in my life-so many that I don't have time to write about them all, but friends, family and food round out the top 3 I think! I hope everyone had a great day of thanks and had the opportunity to take a quiet minute or two to be grateful for all that you have in your lives-my list is certainly long. Now I am off to fix a few knitting disasters (more on this later) and sew a few corrections (more on this later as well!) that I think can save the knitting...busy, busy, busy! It was 28 degrees here today. In the middle of the day. In the full sun. In November. Now it is a frigid 18 degrees and that doesn't include the wind chill. This weather makes me hustle a bit more urgently, to finish my Christmas "makings". Below you can peruse the newest items to come off the production lines in the past day or so. The "Marf" as I have come to call it, or the man scarf, is complete. Originally meant for an unfussy-but fussy- man who can't be encumbered by the limitations of a traditional long scarf. The tails get in the way you see. And if it is tied, it "chokes" him. Fussy indeed. The solution is a turtleneck of sorts. I got the idea from my friend Katie, who made a beauteous version and it got me thinking that perhaps these could cut down on my knitting time in making a traditional long scarf. I didn't use a pattern again, surprise, surprise. I just did a K2P2 stitch after casting on a length I thought would fit around a grown up's neck. (about 22 inches) Then I knit and purled away until the garment just felt right. I did a rib stitch so that it would stretch over one's neck-elastic like. I knit this long and only 25 rows high, including the cast on edge, then sewed it up the back, after binding off the last row. (my first binding off experience, what fun! I have only completed hats so far and those "end" with many decreases, down to one stitch, removing any chances to bind off) This only took me a few un -interrupted after- baby -is -asleep- hours, so I will be whipping up a few more for gifts this season. So I did my usual rebellious modifications, such as not using the recommended backing material (too monochromatic for me), and not sewing each petal one inch up the side ( new Mommies don't have that kind of time) and I embellished the center of the mum with some red beads. For the backing, I made the stripe pattern perpendicular to the front- for fun, or in case the new owner wanted a plain look for the day, then she could flip the mum to the back. This pattern was very easy to follow, and aside from the tedious cutting of the many, many petals, it went together very quickly. I would like to share with everyone that "Wonder Under" could quite possibly be my new favorite sewing notion. Double sided fusible webbing-who knew!?! All these years and I thought it only came sticky on one side!?! I used the envelope pillow case idea for another project that I am not quite at liberty to divulge just yet-stay tuned, there will be a big reveal. I can tell you this: my husband and I are working on a joint project, a big one this time. And no, sorry, it's not another baby. Not yet anyway. We have known that we needed a new roof, or at least some maintenance to the existing one. Who even knows how old the metal roof is?!!? Our house celebrates it's 99th birthday this year, so one can't really be sure. The poor old roof was looking a bit rusty, tired and in need of a freshening. We called several contractors to come have a look and see what could be done with the smallest financial impact. After many a visit with "gentleman" after "gentleman", telling me that we needed a whole new roof to the tune of $10,000 and up-I decided to put my foot down. I typically don't like to engage in arguments with professionals, I do my research before contacting them and then usually trust them to know their stuff, as I expect clients to trust me to know my stuff, when it comes to their weddings. I finally found a contractor that would just paint the existing roof. Wire brush any surface rust, patch any thin spots and paint it a nice glossy black. After all the previous men had been up on the roof declaring it a total loss, this one fine man told me that once they got up there and started painting, they could see that the roof was actually in great shape, only the paint had worn off. Great. I will choose to trust that. The bill came in at about $500-clearly more feasible right now. The contractor told me that if we keep painting the roof every few years, we could get another 50 years out of it. Well, I don't know if that is true, but I appreciate the optimism as we head into the expensive heating and holiday season. The chimney had a bit of a makeover as well, a new brick cap installed, by our kind neighbor, a stone mason who is also installing this little beauty in our backyard. It is in progress, but I can't wait to put little votive candle holders on the shelves during our Winter Cookout by the outdoor fireplace. Yikes, I need to start planning that soon! The roof never leaked and I will choose to believe that until it does, it's new glossy finish was just the fix. I think the roof is happy with it's new makeover-it seems to smile at me every time I pull in the driveway. The past 24 hours have been a steam train full of activity. 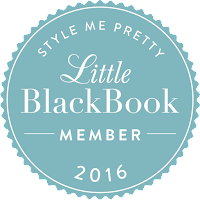 Along with a (molar) teething one year old-who is, to say the least, grumpy and a bit clingy to her mommy (poor little thing), I have somehow been able to cross a few things off of my holiday to-make list. 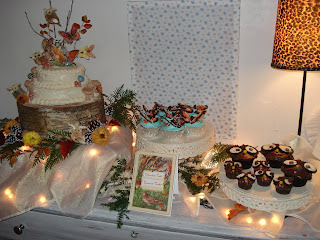 My giving theme this year is as hand made, recycled and cost free as possible. It has been a fun endeavor. Time, love and determination are the real main ingredients. I never had time for this bliss when I worked for someone else...Since I started my own business and Ava was born, I am so fortunate and grateful to be able to spend time doing what makes me the most happy ever-making things, making weddings and raising my daughter into a kind, compassionate, witty, capable, secure and confident little lady. I owe my husband a big thank you here, for working overtime and for some pretty handsome DNA. I enjoy painting the mushrooms with a top coat of sparkle glaze, sold with the acrylic paints at craft stores, as a glittery protective coating. Whilst daydreaming about Amy Butler-her house, her life, her husband, her fabric, her books, her hair cut, her cats... out of production came a few vinyl coated totes made with fabric from my stash and some vintage fabric from the Brimfield Antique Show that I have been saving. This idea is great for vintage fabric that is a bit too special and delicate to use on it's own-iron on vinyl for a tote (or book cover, place mat for outside, baby bib or any other little beauty you can dream up) protects the fabric and adds a bit of extra function I think. You can get the vinyl here. I am yearning for the 20 yard bolt, but I need to get a hold of myself. ... And then started sewing a reusable compartment wine bag for another special someone. I used stash fabric from discontinued furniture upholstery samples that I get from a few great sources at interior design and decorating stores. Delectable chocolate velvet and plum canvas for this red wine lover was just the color palette...It just needs handles now. A quail rattle stuffling was next, for a friend's baby. I sewed in satin ribbons and a little ric rac loop for hanging from a mobile or clipping on to plastic rings. Ava loved to feel satin ribbons when she was smaller and enjoyed laying under dangling rattler items before she could move about. I hope this little birdie will be loved too, she is even has 2 different sides in a black and white contrast for young eye balls! A little seal stuffling was next to be born, for another child's gifty- a folky little face and a tuxedo stripe fabric on one side, and a coffee colored chenille on the back. I think he needs something though...Ears? Definition on the tail flippers? He is a bit unrecognizable. He just sort of came out of the sewing machine, before I could even think about my plan of attack...Again, no pattern, just imagination, so sometimes I have to accept a little lopsided whimsy. Okay, is that enough for today?!? I have to go finish a "marf" I am making, you know -a man scarf! Let's see..I haven't been able to write for a while. Just what have I been up to? First there was my Dad's 62nd birthday. (He is wearing a birthday hat (fully equipped with hair) not a new hairdo-it clearly would be a "hair-don't"!) This occassion deserved a new recipe: Pumpkin Chocolate Cheesecake Pie, a trifecta of my father's fave flaves. So much for retirement! 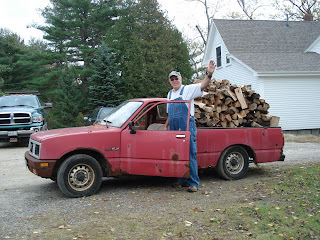 He has already clocked in at the labor farm, tending to his obsessive fire wood habit...Heaven only knows how long that Isuzu Pup will hold out! Then there was the big one, my first baby's first birthday...It has been a very emotional month so far for me. There have been many preparations, decorations, confections, congratulations and salutations happening in my life these past few weeks, I have been a bit too occupied to post here! My apologies, I will attempt to fill you in! 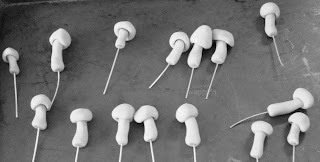 Okay, the birthday cake mushrooms I made came out so well, they will be reproduced in little bunches for Christmas supplements-to add to a wreath, a baked good, or a potted plant or two. Non-edible, but oh so cute! I constructed Ava's cake top from paper and wire, complete with little fairies riding bumble bees on "buzzing" spiral wires. One little fairy rides a butterfly among the owls and mushrooms. 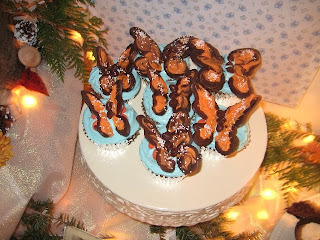 The Carrot Cake with Cream Cheese frosting was a moist and scrumptious success, as were the Monarch Butterfly Cupcakes (with wings made of chocolate) and the Chocolate Owl Cupcakes...You see I really have been busy! My darling husband took one look and reminded me that birch bark would not be visible from inside the tree...Who made him boss of birch bark anyway!?! I lined the floor of the hollow stump with my Mother's butterfly quilt she made for Ava when she was born, so she could be with us, though she wasn't able to be with us in person. My Dad, upon request, made me a birch log base to put her cake upon, so perfect for a woodland fairy cake! I added some cuttings from our yard, some pine cones from my stash and my step-mother's specialty, cocoa dusted meringue toadstools-these are edible! To a robust and sincere rendition of "Happy Birthday", our one year old "baby" took her first ever bites of cake. With dainty precision, she sampled the frosting first, then exclaimed, "MMMM!!" and proceeded to utilize her pincer grasp to hoist a hunk of cake into her mouth. I think she may have inherited my sweet tooth. She then rubbed frosting in the back of her hair, with both hands and with vigor. You can see the wild rumpus style she created, above. During the following bath, I found frosting in her armpits... Ava quite enjoyed the fairy planet mobile I made to hang over her new "big girl" high chair for the festivities. There were no birthday melt downs and no crying, just elated joy with each gift and laughing, crawling about and riding her new "quadricycle". Her dad did the filming while I had present assistance duty... The cats performed wrapping material round up. 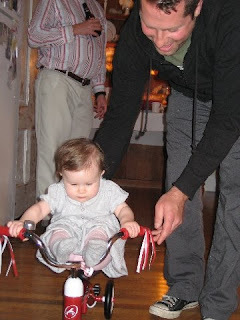 After this ride, Ava coerced her father into escorting her for a ride all the way into the kitchen where she proceeded to purposefully (look at that face of concentration!) show off her moves, which consisted of riding with her feet on the handlebars?!!? Where did she learn that?!? When you live in a small house and your child is born in the winter months, you have to accept some limitations...I wish we could have had all of our friends here with us, but alas, family alone accounted for 16 of us-and just the right size for this house and for Ava I think. For those of you who weren't with us on this most momentous occasion for us, I hope this post is a juicy enough account for you to feel as though you were here. Happy Birthday Dad, Happy Retirement, Happy Birthday Sweet Ava, we have enjoyed celebrating all of these great times with you! The view from my window is well-busy. The last of the autumn leaves are making their way to the ground and the air is oh so much chillier. We finally had to turn on the heat-we always try to get to the the end of October, but alas, Old Man Winter wore us down again this year. 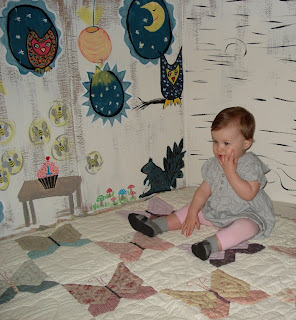 I have been sewing the woodland creatures for Ava's first birthday. 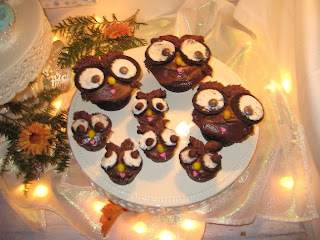 First came a little owl. The idea struck me in the middle of the night, as usual. Ava's favorite creature so far seems to be an owl, so I thought it fitting for her to have some of her own. A wild owl would be too hard to tame and feed, and I don't think it would be right to have a real owl of course, they belong in the wild. I didn't even look for a pattern, I just went wild and as a result, the owl has a crooked shape and a slant to his stature. I like to think of it as a touch of whimsy, not a lack of planning on my part. So I obliged and whipped up a little family for him. I stuffed their little feet with dry split peas so they could stand on their own. I think all creatures like to stand on their own, don't they?!? I know I do. But alas, this little Owly family was homeless in a sense. Out of place in the kitchen, too cold outside on the wood pile...They needed a home, a proper home for an owl family. Ava's birthday fairies... I am happy I collected the maple tree seeds for wings in July for this project-there are none to be had now! I have some birthday planning to do, some recipes to research and some serious house cleaning to attend to-and I feel more like sneaking off to bed, under the down comforter at 6:30 at night, with a juicy new magazine. I must push through the first days of daylight savings-always a tough transition. If anyone out there has sunlight past 5 p.m. please send some our way!